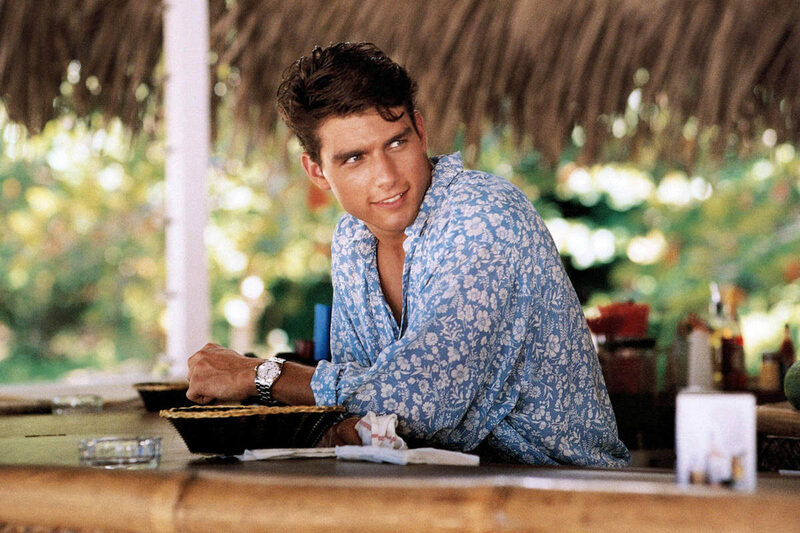 Tom Cruise wears a light blue shirt with floral motifs for the Caribbean heat as rebellious bartender Brian Flanagan in Cocktail, 1988. The decades leading up to Cobain’s cover shoot saw florals go on an evolutionary journey, with some of the 20th century’s most admired rock gods and Hollywood pin-ups in full bloom. Between the 1920s and the 1950s, Hawaiian shirts experienced a surge in popularity, influenced by Japanese kimono fabric. Initially created as a tourist’s souvenir for the island, the ‘Aloha’ shirt trickled into American pop culture, bringing with it a little island spirit; from Tom Selleck in Magnum P.I. to Al Pacino in Scarface, by the 1980s loud prints and bold colours were practically a wardrobe requirement. Meanwhile, Jimi Hendrix and The Beatles had been deep into the flower power movement of the 1960s and ’70s, with psychedelic floral prints, ruffled fronts and billowing sleeves giving them fluidity and movement on stage and off. John Lennon’s tailor Nudie Cohn was also instrumental in the blossoming trend, embroidering eccentric suits for Elvis, Elton and Bowie with colourful bouquets. By the 1990s, floppy hair and intricate floral print shirts were being served up by River Phoenix and Leonardo Di Caprio in Romeo + Juliet; it was a youthful, care-free aesthetic that embodied romance and rebellion. Both wore theirs with dark blue trousers with a turn up, white socks and sneakers, and both would look great today. As Poison sang, though, every rose has its thorn and floral prints should be approached with a little caution. One way to ease into the style is by investing in a plant-based print, like Enlist’s short-sleeved shirts in flattering blues and greens. The tonal palettes and over-sized patterns bridge the gap between boring and bold, and would fit seamlessly beneath a classic blazer in navy or ecru (always balance a big print with solid blocks of colour). If a boxy fit feels a little stiff, roll the sleeves up, undo a couple of buttons and throw them on over a white T-shirt to soften the edges. Play up to their retro feel by pairing with a bomber jacket, selvedge denim and lace-up boots. 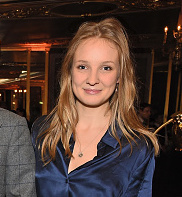 Cobain’s dress and Di Caprio’s shirt sit at the more extreme end of the spectrum, so if they feel a little out of your comfort zone or simply too casual for your nine-to-five, seek out accessories to get your garden on. Neckties are by far the easiest place to start, and there aren't many who do printed ties better than British brands Turnbull & Asser and Drake’s. Pick a colour from the print and match it with other details in your outfit like your socks or pocket square, and don’t wear more than one floral at once (unless you’re Paul McCartney). Quality fabric will make all the difference in how well your florals look and last, as it will affect colour strength and design accuracy. While a floral tie is perfectly fine for business attire, a floral shirt tends to be more suited to informal settings, so avoid pinstripes over petals. As Kurt Cobain told music title Melody Maker, “there’s nothing more comfortable than a cosy flower pattern,” so embrace them for summer soirees, city breaks and the beach. Cordone 1956’s micro-florals bring a sophisticated, grown-up finish to a pair of shorts and Calabrese 1924’s tropical trunks are pure unadulterated fun – which is, after all, exactly what florals are all about.